The RocketStor 6324L Single Mini-SAS to Thunderbolt 2 Adapter from HighPoint allows you to connect Mini-SAS storage, such as the RocketStor 6414S, to your Thunderbolt-compatible system. As this adapter features one Mini-SAS port, HighPoint's separately sold EXT-MS-1MMS External Mini-SAS to External Mini-SAS cable can directly support up to four 6 Gb/s SAS or SATA devices. Additionally, using HighPoint's separately sold EXT-MS-1MEJ external Mini-SAS to eSATA cable, the one Mini-SAS port of this adapter can directly support up to four 6 Gb/s SATA drives. Aside from the one Mini-SAS port, this adapter is also equipped with dual Thunderbolt 2 ports, each of which is capable of delivering bi-directional data transfer speeds of up to 20 Gb/s. While one Thunderbolt port is used for connecting this device to your system, the other may be used to daisy chain up to six Thunderbolt devices together, such as Thunderbolt displays, additional storage, and more. Please note that the RocketStor 6324L only supports JBOD and software-based Mac OS X RAID configurations. It does not support hardware RAID configurations. The RocketStor 6324L Single Mini-SAS to Thunderbolt 2 Adapter includes a power adapter and a power cord. It is compatible with Mac OS X 10.8.5 and later, as well as PC-only configurations of Windows 7 and later. It is protected by a limited 1-year parts and labor warranty, as well as phone and Skype support. 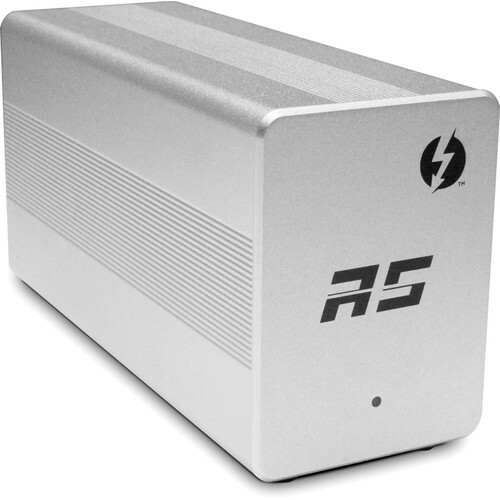 Box Dimensions (LxWxH) 13.307 x 7.008 x 3.78"
RocketStor 6324L Single Mini-SAS to Thunderbolt 2 Adapter is rated 5.0 out of 5 by 2. Rated 5 out of 5 by Tim from eSATA Hub! This is The ONE Setup: One word: Easy. Just about anyone could set this up without even knowing what it is. Mini-SAS cables for your drive enclosures, Thunderbolt cable to your system. Plug in the power cord, turn it on, and your done! The driver is an installer package just run it in OSX and reboot. Its all pretty brainless, which is ideal I suppose. You can configure everything using Disk Utility no need for any additional interface. Hub or Adapter? Basically, in this case, they may as well be one in the same. It works like a hub (USB, eSATA, etc). I bet the name is due to the manufacturers history with RAID cards, and it might have been better off labeled as a hub (people wouldnt be left wondering what it is. Like a hub, you connect your storage boxes using Mini-sas/eSATA cables and connect the adapter to the system using a Thunderbolt cable (which is included). I thought it would be large compared to the Lacie eSATA Hub, but it really can be held in one hand and weights next to nothing. Carrying it with you is a realistic proposition, and is complete dwarfed by a trashcan Mac Pro, which is kind of ridiculous really. Verdict: I have to say I know like it better than my Lacie hub. Its faster (Thunderbolt 2), supports more drives (up to 4) and seems to work fine with any enclosure (G-Tech, Icy Dock, Lacie). Definitely worth the higher price. Rated 5 out of 5 by JasonBak from Good Solution Used to connect a Mac Pro to a Wiebetech 4 drive bay enclosure via Thunderbolt. Have no issues. Will this work with a G Speed es pro configured as RAID 5? Unfortunately, it will not work. We recommend you to buy a RocketStor 6324 instead. Please note you will need to use SATA 6G HDDs with this device. Does it work with a iMac27' and a LTO6 tape drive? It is compatible with Apple computers that have Thunderbolt. It is not compatible with LTO Tape Devices.